Riddells Creek, a rural/residential township, is in undulating country south of the Macedon Ranges. It is 15 km north of Sunbury and 45 km north-east of Melbourne. 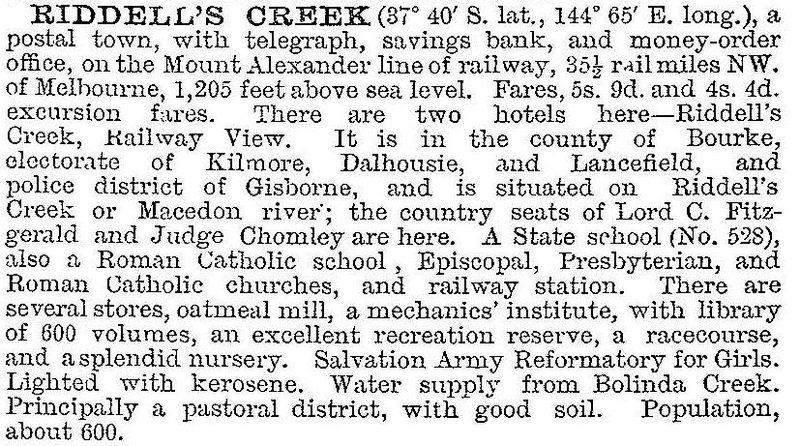 Riddells Creek was named after a settler, John Riddell, who acquired a property of one square mile in 1841. A flax mill was opened at Riddells Creek and during World War II the Womens’ Land Army harvested and processed the flax. They lived in ‘Beulah’, the former Salvation Army girls’ home. Riddells Creek experienced some urbanisation with the development of Sunbury as a satellite town and with the opening of the Tullamarine Freeway (1970). Between 1976 and 1996 its population nearly tripled to 1216. Riddells Creek has a shopping centre, a primary school with an enrolment of 316 (2014), Anglican and Catholic churches, a mechanics’ institute (1875), a recreation reserve and several sporting bodies. Judge Chomley’s residence was acquired by the Manton family to house a distinguished Australian art collection and subsequently by booksellers Court and Joyce Oldmeadow. They renamed it Dromkeen, and it became the permanent home of a childrens’ book collection and related artwork. A railway bridge (1859) is on the Australian and Victorian historic buildings registers, and the railway goods shed and platform (1889) are on the Victorian register. In 2013 plans were made for a new supermarket, as well as 12 new shops, on Station Street in Riddells Creek. The Macedon Ranges Shire released a plan (2013) highlighting population growth and retaining neighbourhood character in Riddells Creek to 2036.